Overview: Buckle up for the most precious bike trip of your life time. Stopover in sapphire lakes, rusty terrains, peaceful outback and almost anywhere your heart wants to. This is not where your burdens will dare to follow you; this is where you dig out your fantasy and put it straight into reality. So, let the magic of marooned monastery, independence and soft breeze, swirl up your senses for the good. Read the details further for a better idea of the journey. This 8 Nights & 9 Days biking trip is going to give you a chance to ride on some of the best Himalayan roads. 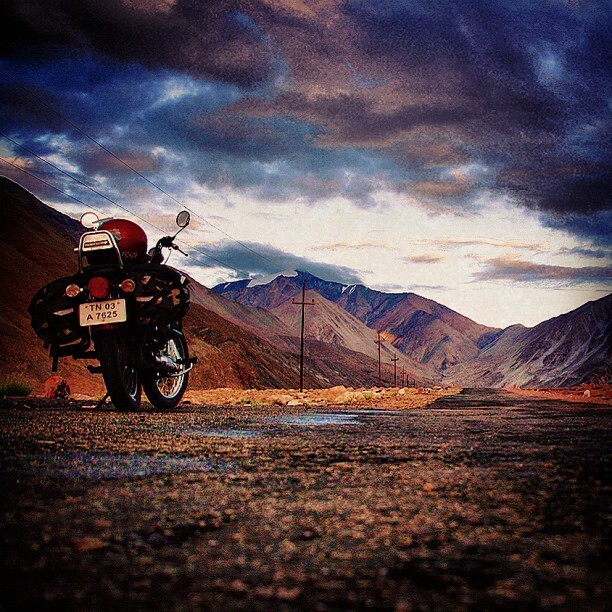 On this motor bike expedition Leh, you can choose to ride alone or with a partner. Remember that your road journey will be picturesque, but strenuous. The bumpy, narrow and winding mountain roads with blind curves, deep gorges and ravines at numerous points will keep pumping adrenaline through your veins. All this will make you tired, but once you gaze at the amazing views, you will be immediately refreshed. Feel accomplished to ride past the Khardungla pass, the world’s highest motorable road, 5606m above the sea level. Arrival at Leh; 3505 meters / 11567 feet. Your flight from Delhi would be an early morning one. On this day when you arrive Leh by air you would witness one of the most beautiful sights of Leh valley amidst the spectacular Himalayan peaks. We shall receive you at airport and take you to your hotel. This day you take it easy – its 10,000 ft and you need to acclimatise to get used to low oxygen levels. So take this day at leisure. For non-Indian tourists this day will be used for applying and processing of mandatory inner line permits. Your bikes would also arrive at your hotel and we could go out for a small trial ride. Otherwise just walk around the unique Leh market; no exertions today. This is the day we have kept for a local tour of Leh region on a motorcycle. Early this morning you will attend the morning prayers at Thiksey monastery where you will witness young and old monks begin their day with prayers and chanting. Another day to acclimatise as also cover some essential tourist spots – Leh palace, Shanti Stupa, Hall of Fame Museum, a Ride to Shey, Stok Palace and Hemis monastery. It’s a good day to get used to your bike and the traffic conditions. After breakfast in the morning leave for Uletokpo by bike for camping which is one of the most beautiful camping in the Ladakh region. En-route visit Spituk Monastery. Continue drive to visit Alchi and Likir Monasteries, the phenomenon of Magnetic hill and the scenic Bazgo plains. By the lunch time, you will reach Uletokpo. On this day you would be pretty comfortable with your Royal Enfield. In the evening, enjoy sitting on the bank of river coming down from the Ridzong side. Overnight stay at camp. This day we ride to explore some very unique landscapes of Himalayan region. A scenic ride through some fine rocky faces to visit the Lamayuru Monastery and Moonland. Drive towards Lamayuru via Khaltsi, the oldest monasteries of Ladakh region. This monastery was founded in the 10th Century. Late afternoon drive back to Leh by bike for overnight stay at hotel. Fairly acclimatised and used to your iron horse, this is a landmark day. Today you would ride on to the World’s highest motorable pass – Khardungla ( 18,380 ft) and cross into the beautiful Nubra valley through some deep gorges. We camp overnight at a typical high altitude Ladakhi village. Witness the rustic lifstyle of people in these most rugged terrains of the World. What you ride today has been for thousands of years a caravan route that used to feed the Silk route through Karakoram pass. We ride out after breakfast and explore the beautiful Nubra valley. The green hamlets nestled in the valley supporting life. The essential tourist spots we see today are the Hunder sand dunes; double humped Bactrian camels and unique Diskit monastery. The Bactrian camels are wonderful remnants of the trading days. At noon we ride back to Leh, via Khardungla pass and check into your hotel. Enjoy the rest of the day shopping or lazing out. This day we take on the third axis – a ride to Pangong Tso through Changla Pass 17,350 ft. third highest motorable road in the world, beautiful grazing grounds and landscapes. By noon you would arrive at one the most spectacular vistas of your life – the Pangong Tso Lake, the highest salt water Lake in the World. It has some of the most beautiful hues of blue that you would ever see in your life. It’s a lake that extends deep into China with only one-third with India. And a night by the lakeside camp is an experience of lifetime. After visit the fascinating valley of nomadic side and the 142 km long the Pangong lake, drive back to Leh through same route via Changla passes and overnight stay at hotel in Leh. You have had one of the most unique experiences in life. It’s time to fly out of Leh.